Kentucky is among the top ten states with the highest opioid-related overdose deaths. 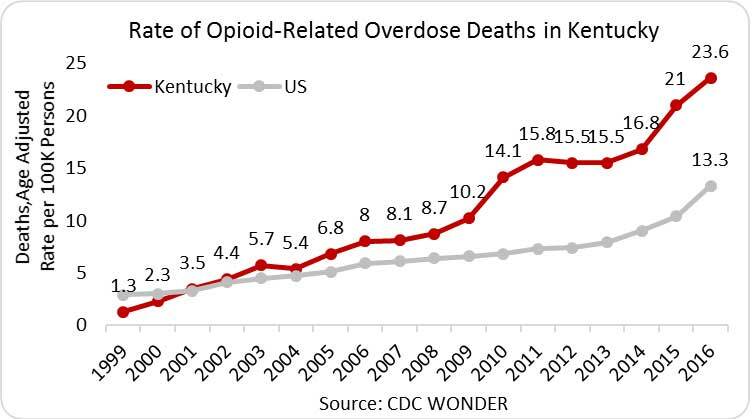 In 2016, there were 989 opioid-related overdose deaths­­­ in Kentucky—a rate of 23.6 deaths per 100,000 persons and nearly double the national rate. 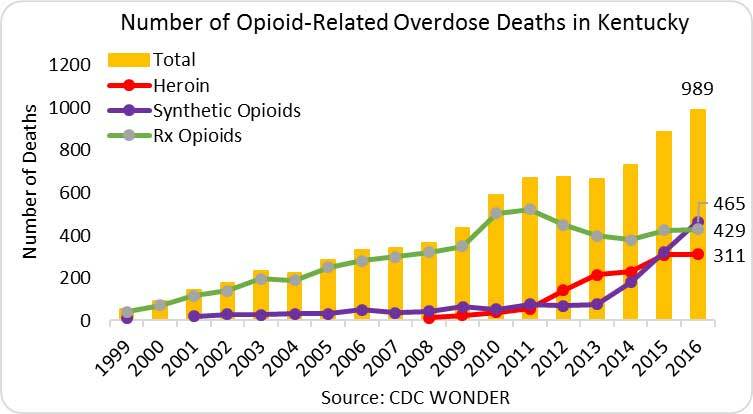 Since 2012, overdose deaths related to heroin have increased from 143 to 311 and deaths related to synthetic opioids have increased from 70 to 465. In 2015, Kentucky providers wrote 97.0 opioid prescriptions per 100 persons (4.47 million prescriptions). In the same year, the average U.S. rate was 70 opioid prescriptions per 100 persons (IMS Health, 2016). Kentucky NAS rates continue to rise. The incidence of NAS in Kentucky increased from 0.4 cases per 1000 births in 2000 to 15.0 cases per 1,000 births in 2013—a more than thirty-sevenfold increase (CDC, MMWR, 2014). The average across the 28 states included in the 2013 analysis was 6.0 per 1,000 births. U.S. Incidence: In 2015, 9.1 percent (3,5941) of the 39,513 new diagnoses of HIV in the United States were attributed to IDU. Among new cases, 8.2 percent (2,6141) of cases among men and 13.2 percent (980) of cases among women were transmitted via IDU (CDC). U.S. Prevalence: In 2014, 955,081 Americans were living with a diagnosed HIV infection—a rate of 299.5 per 100,000 persons. Of these, 18.1 percent (131,0561) of males and 22.6 percent (52,013) of females were living with HIV attributed to IDU (CDC). State Incidence: Of the new HIV cases in 2015, 336 occurred in Kentucky, with 7.5 percent1 of new cases in males and 10.0 percent of new cases in females attributed to IDU (AIDSVu). State Prevalence: In 2014, an estimated 6,511 persons were living with a diagnosed HIV infection in Kentucky—a rate of 177 cases per 100,000 persons. Of these, 14.5 percent1 of males and 20.9 percent of females were living with HIV attributed to IDU (AIDSVu). U.S. Incidence: In 2015, there were 181,871 reported cases of chronic HCV and 33,900 estimated cases of acute HCV2 (CDC). Where data were available, 64.2 percent of acute cases reported IDU (CDC). U.S. Prevalence: An estimated 3.5 million Americans are living with HCV, including approximately 2.7 million living with chronic infections (CDC). State Incidence: In 2015, Kentucky reported four cases of chronic HCV and 121 cases of acute HCV (2.7 cases per 100,000 persons) (CDC). In 2015, Kentucky had one of the highest incidence rates of HCV infections in the US (MMWR). State Prevalence: As of 2015, an estimated 38,000 persons were living with chronic HCV in Kentucky (KY.gov). 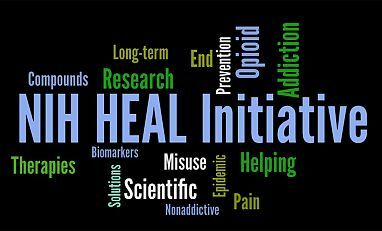 The National Institute on Drug Abuse (NIDA), in partnership with the Appalachian Regional Commission (ARC) are supporting services planning research grants to address a dramatic increase in adverse outcomes associated with increased opioid injection drug use in Appalachia. The grants will help develop an epidemiologic understanding of opioid injection drug use, HIV and hepatitis C virus (HCV) infection risk, and other adverse health consequences of drug use in any of the 420 Appalachian counties (http://www.arc.gov/counties). Includes transmission to individuals with injection drug use as a risk factor. 2015 estimate after adjusting for under-ascertainment and under-reporting. Data for 2015 were unavailable for Alaska, Arizona, Connecticut, the District of Columbia, Hawaii, Iowa, Mississippi, New Hampshire, Rhode Island, and Wyoming.